In this Picture Puzzle, there are two similar looking pictures containing different types of memory cards. This Picture Puzzle is for Genius Minds who has very good observation skills. To make this Find Differences Puzzle tough, one of the two picture is vertically reflected. Consider yourself genius if you can find all 5 differences in these two pictures without looking at the answer puzzle image? Can you find 5 differences in these pictures? 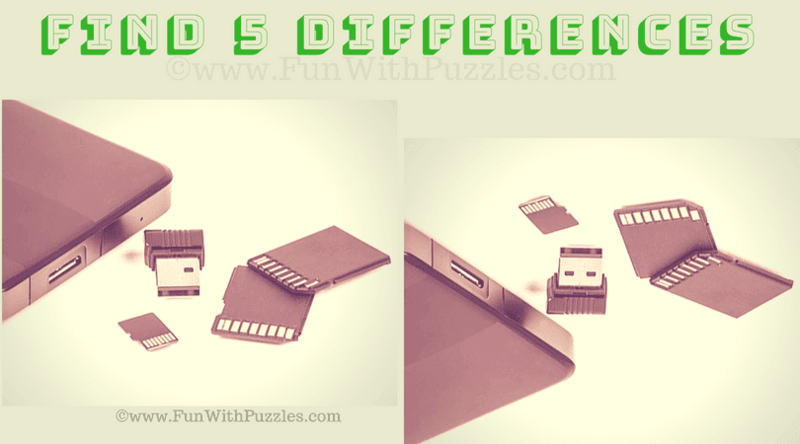 Answer of this "Find 5 Differences" puzzle, can be viewed by clicking on button. Please do give your best try before looking at the answer. Do checkout below listed picture puzzles and brain teasers which will test your observation skills. Can you find Odd Letter Out? : These are the visual puzzles in which your challenge is to find the odd letter out among the given set of letters. Can you find hidden C? : These picture puzzles will test your observational skills. Your challenge is to find the letter C hidden among the other similar looking letters. Picture Puzzles with Answers: These are the different picture puzzles in which each puzzle gives you different challenge e.g. find odd one out, finding the hidden animal in given picture or finding the hidden letters in the given picture puzzle images. Critical Thinking Puzzles-Crack the Code : These are critical thinking puzzles which will test your logical reasoning. In these puzzles your challenge is to crack the code to open the lock.